On Wednesday, Centerplate, a multinational food and beverage concessionaire, filed a joint motion in Northern California District Court asking a federal judge to approve a $5.45 million settlement to resolve wage and hour complaints brought by the company’s employees in California. The lawsuit, Raquedan et al v. Centerplate, alleges that Centerplate, which holds contracts with numerous sports facilities in the United States, broke a long list of state labor laws—including the failure to pay overtime wages or offer rest breaks—while operating in California. In the proposed settlement, Centerplate denies any wrongdoing, but the conditions described in the lawsuit certainly sound familiar to me. In December of 2015, I was hired by Centerplate to serve food and drinks at Levi’s Stadium in Santa Clara, Calif. During the brief interview, I mentioned that I was a freelance writer and in need of money—no lies there—and was assigned to work in the Chrome Grill, an upscale food court on the fourth floor that looked out over the center of the field. I was there to report on working conditions at the stadium. 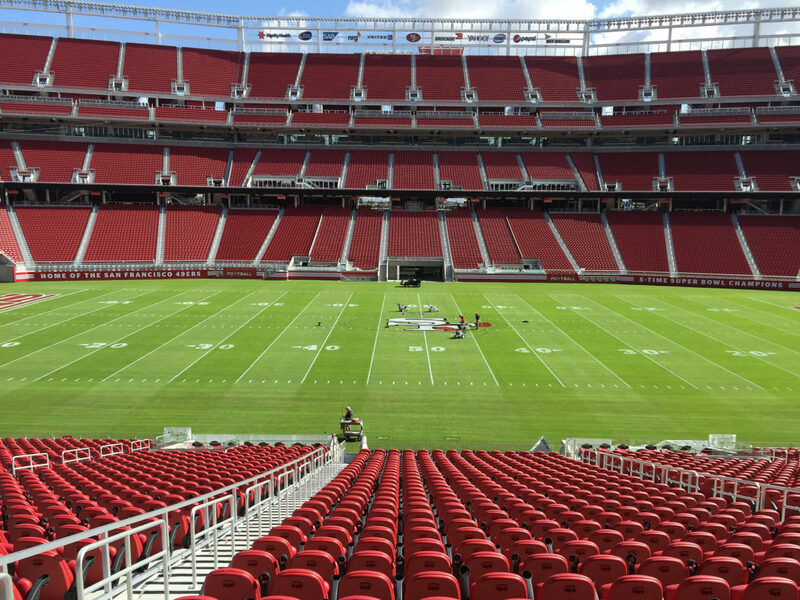 In two months, the national focus would turn to the field at Levi’s Stadium when it hosted Super Bowl 50, which pitted the Denver Broncos against the Carolina Panthers. But scant attention would be paid to the workers who actually make the Super Bowl possible, and who—despite living in one of the most expensive areas in the country—earn well below a living wage (my pay was $12.25 an hour). My investigation was part of a year-long partnership between The Investigative Fund, now known as Type Investigations, and Slate on a project called The Grind, which sought to expose the hidden labor abuses behind “some of our cherished annual traditions.” On Super Bowl Sunday, those abuses weren’t hard to find. As I wrote in the article for Slate, workers at Centerplate were instructed to arrive two hours before they clocked in, and many spent another several hours being transported back in company vehicles to their cars after clocking out. Along with these unpaid hours, we weren’t given the required rest breaks, nor overtime pay. 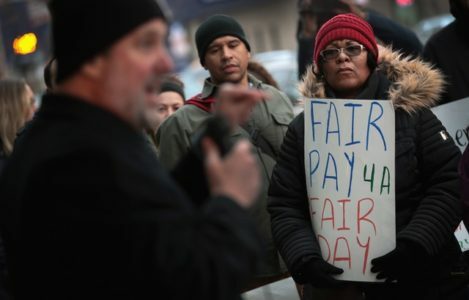 I filed the story, and soon after filed a lawsuit, alleging that Centerplate had failed to pay Super Bowl workers for all the hours they had worked, failed to provide rest breaks, and failed to pay overtime as required by law. The suit was settled and approved by district court judge Edward J. Davila in March 2017, with Centerplate agreeing to pay five addition hours at an overtime rate to each employee who had worked the Super Bowl. Among the Centerplate workers who received Super Bowl settlement money were Monique Raquedan and Ronald Martinez, who had been hired by the company in the summer of 2014. Several months later, in July, they filed their own class action lawsuit, alleging the labor violations during the Super Bowl—like the failure to provide rest periods—were not just confined to the Super Bowl. In their complaint, they alleged that Centerplate also failed to provide meal breaks, required employees to pay for their uniforms, and “maintained a policy or practice of not paying” sick days that should have been covered, among other violations of California’s labor code. The workers were represented by attorneys at the Setareh Law Group, based in Beverly Hills, and brought the action on behalf of all non-exempt Centerplate employees who had worked at any California venue since July 5, 2013. That proposed settlement comes, of course, just days before Super Bowl LIII, to be held this Sunday at the Mercedes-Benz Stadium in Atlanta. On the field, the New England Patriots will battle the Los Angeles Rams. Off the field, fans will be served by workers at Levy Restaurants, the Chicago-based company handling concessions. Levy Restaurants expects to sell 125,000 beers, 100,000 sodas, and more than 25,000 hot dogs. As someone who has worked a Super Bowl, I’d advise each Levy employee to expect a long day ahead—and to track your hours closely. 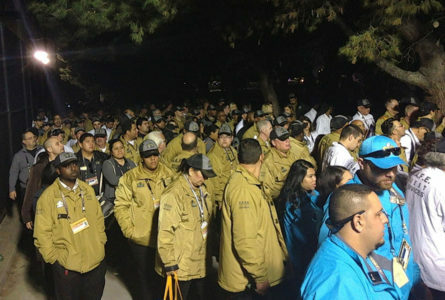 What it's like making less than $13 an hour to serve $13 beers at one of the biggest games on Earth. A year-long series on the myriad ways workers are being shortchanged, revealing the exploitative and dangerous labor conditions behind our holidays and rituals — from New Year’s resolutions to Christmas shopping.